The Okanagan Valley is just three hours drive from Vancouver, Canada and lays claim to being the most recently planted pinot noir region. Having tasted a few of the pinots from the Okanagan Valley I can testify to the fact that this region is up there with the Willamette Valley and Central Otago in terms of the potential for pinot. 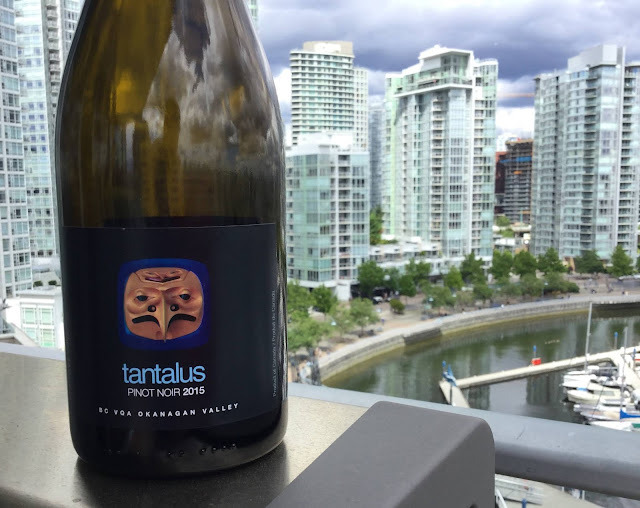 Tasted chez Albert Lee at the Marina in Vancouver, this Okanagan 2015 from Tantalus has a dark red colour with a touch of orange on the rim. Blueberry and violets are the first aromas to tease the nostrils. It is fragrant, with notes of orange flower water, morello cherry, French oak and a hint of cinnamon. Interesting with good complexity. This pinot from British Columbia has a rich plum fruit flavour, good phenolic ripeness, very concentrated cherry. Good ripe tannins, medium acidity and a fresh finish. Could age another 1-2 years and has 14% alcohol. Very enjoyable as it is ripe and subtle. Scores 78/100.